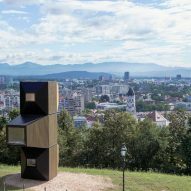 Slovenian studio OFIS Arhitekti has found a new use for the micro house it designed earlier this year – the modular structure recently served as a temporary library in the grounds of Ljubljana Castle. 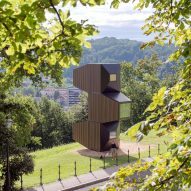 OFIS Arhitekti worked in collaboration with fellow architects C+C and C28, engineering firm AKT and contractor Permiz to create the Living Units – modular rooms that can be combined vertically or horizontally to create larger structures. 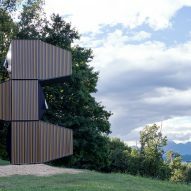 The units are designed to suit a variety of locations, climates and terrains. 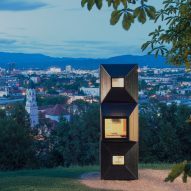 They were first presented at Milan design week earlier this year as a prototype for a modular home – but the designers are now considering a wider variety of uses. 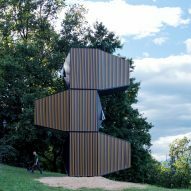 Each of the angular modules measures 2.5 metres wide, 4.5 metres long and 2.7 metres high. 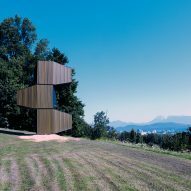 They are designed to work as a single cell, with enough room inside for a bed, kitchen and bathroom. 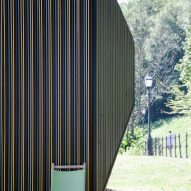 The interior spaces of the units are also flexible. 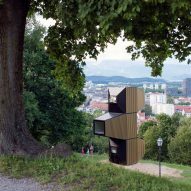 They can be reconfigured when used in combination, so the sleeping areas are separated from the kitchen and lounge. 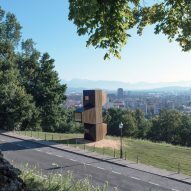 At Ljubljana Castle, the units were adapted to accommodate a small library – situated alongside a promenade designed by Slovenian architect Jože Plečnik. 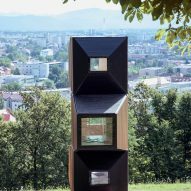 An open-air exhibition marking the 145th anniversary of Plečnik's birth was installed along the walkway, so the library was filled with books focusing on the architect's output. 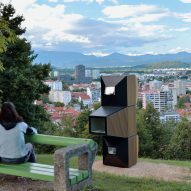 Each of the three stacked units provided a platform for visitors to read and relax, while looking out across Ljubljana through large picture windows. 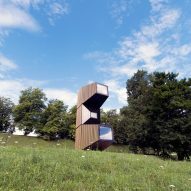 The top and bottom modules were oriented with their tapered ends facing the city's skyline, while the central unit faced the path and a grassy slope behind. 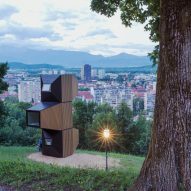 The counterbalanced configuration is considered optimal when combining three modules vertically. 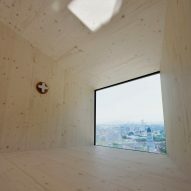 Wooden platforms inside, which usually serve as beds and living spaces provided seating for readers. 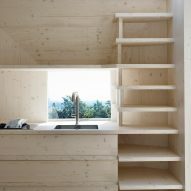 Meanwhile, built-in shelving and ladders provided convenient storage for books. 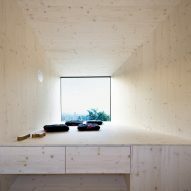 The Living Units feature timber frames that are reinforced with plywood boards on either side. 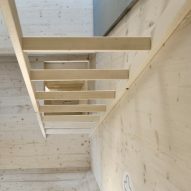 The stacked structure is stabilised using steel anchors or removable concrete cubes rather than permanent foundations. 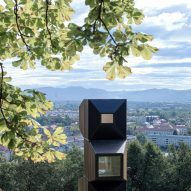 OFIS Arhitekti has experimented with small-scale architecture on several previous projects, including tiny cabins perched in picturesque locations on Slovenia's Skuta Mountain, and Mount Kanin on the Slovenian-Italian border. 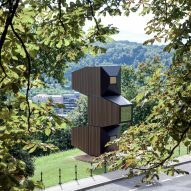 The studio is led by architects Rok Oman and Spela Videcnik. 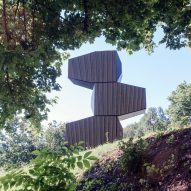 Among OFIS Arhitekti's larger projects are a house comprising a trio of stacked boxes and a bulbous stadium punctured by spotty openings for a Belarusian football club. 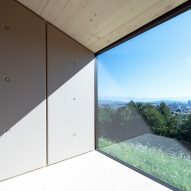 Photography is by Janez Martincic.